In Grimstad, you can cycle as far as you like, as quickly as you like, and where you like – on forest lanes or along the coast – the choice is yours. A wide range of routes are available, and the terrain is gentle. National Cycle Route no. 1, running along the southern coast, leads through Grimstad. The town is also the perfect base from which to explore the coastline as well as the inland. Bicycles can be hired at the tourist office. Visitors with boats moored in the guest harbour only pay half the hire charge. 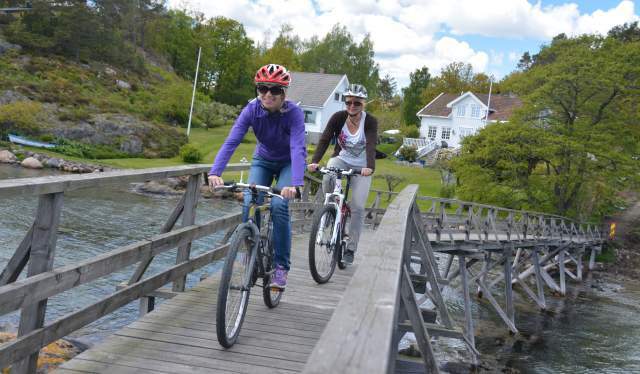 For advice on bicycle routes, please ask for the leaflet: "Grimstad by bicycle". For a proper training ride, one of Thor & Dag Otto's Cycle Routes is recommended. However, you have to be in good enough physical condition to last for about 40 km on a racing bike. The tourist office is a "Cyclists Welcome" company, and has made a special commitment to look after and provide cyclists with good service. This concept has also been adopted by some of Grimstad’s accommodation providers. Among these are Strand Hotel Fevik, Scandic Hotel Grimstad, Café Ibsen, and Marivoll Resort, which all extends a particularly warm welcome to cyclists. In 2006, Grimstad became part of the National Network of Cycling Cities – an initiative introduced by the Norwegian Public Roads Administration. Since then, continuous efforts have been made to increase the level of bicycle use in the municipality. The infrastructure has been improved, and measures to encourage more cycling activity have been implemented. 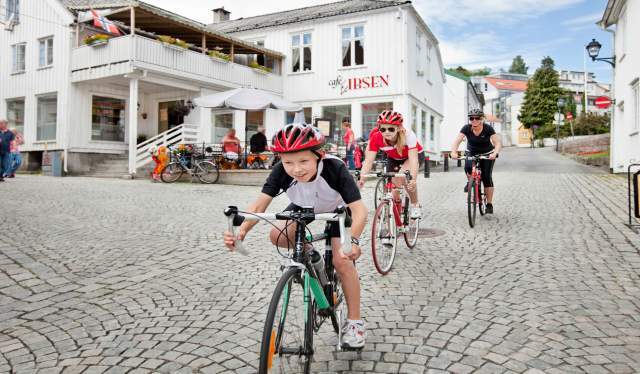 Grimstad is also renowned for its active cycling community, with Grimstad Sykleklubb as the driving force. The people of Grimstad are very proud of Thor Hushovd and his sporting achievements – in particular his victory in the 2010 World Championships.